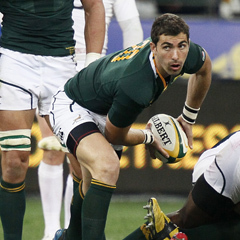 Cape Town - Whether it will influence coach Heyneke Meyer remains to be seen, but at least one respected member of the visiting English media believes Springbok substitute Ruan Pienaar was the premier scrumhalf of the Test series. Eddie Butler, a former Wales captain and long-time writer for The Observer, wrote after Saturday’s drawn third and last contest in Port Elizabeth that England No 9 Danny Care (officially named player of the match) had “brought a zip to the position” but felt that Ulster-based Pienaar “looked the pick of the scrumhalves in this series”. Pienaar got good game-time in the second half of each Test as the relatively unconvincing Francois Hougaard was pulled off the park, and Butler suggested the former Sharks favourite had limited time on the field “as a result of plying his trade in Europe”. Many South African critics have concurred that Pienaar’s seemingly superior all-round game to Hougaard’s is worth noting as the Boks now size up the Castle Rugby Championship. Butler was relatively lukewarm about England snatching a dead-rubber draw to stave off a clean sweep. “It was reassuring confirmation of the refusal by Stuart Lancaster’s team to do anything other than keep going. Never give up. Chase every cause. But former England and Lions lock Paul Ackford, in the Sunday Telegraph, wasn’t quite so sure: “This was a Bok team that never got out of first gear ... (they) need to regroup and rethink if they are going to trouble the All Blacks this year. He was generous to England for their courage and commitment. “England had no right to be as gutsy and passionate as this. It was their last game of a long season, which began over a year ago in the pre-World Cup camp. Chris Hewett of the Sunday Independent ventured: “A dead game? Not for England, who were full of life ... still breathing, rather more strongly than their hosts, when Owen Farrell’s majestically unsuccessful attempt at a decisive dropped goal signalled the end of a hard tour.